This article continues from our previous SSD report by focusing on the performance and efficiency of 256GB-level SSDs. In addition to possessing a larger capacity, the 256GB SSDs are superior to their 120GB counterparts in terms of read and write speeds, and are generally perceived to be more ideal for system drives and notebook PCs. The 256GB version of SP920s is one of ADATA's most effective SSD lines that features the standard MLC-based NAND Flash chip and Marvell's controller chip. 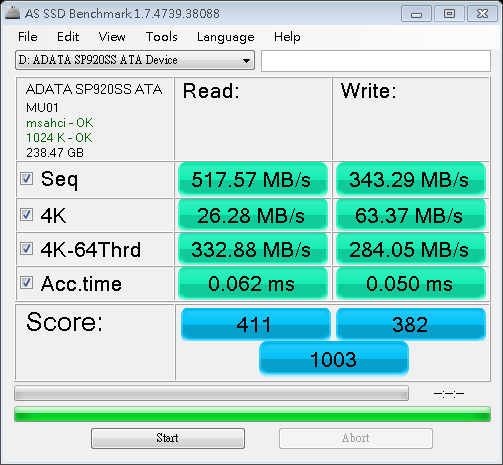 ADATA’s SP920s performed well when tested on AS SSD, earning a highly impressive score of 1003. 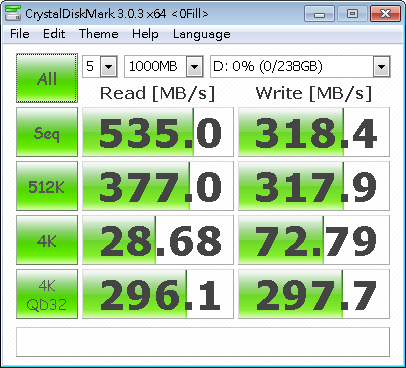 Both the SSD’s read and write speeds are strong thanks to its use of Marvell’s controller chip. Under the CrystalDiskMark test, SP920s showed decent read and write speeds that are consistent with the product's official specs. The read score shown under the IOMETER test is significantly larger than the write score, and appears to be above average when compared with the other SSD brands. The other major SSD we tested from ADATA was its SX300, which uses a 19nm MLC-based NAND Flash chip and SandForce's LSI controller chip. The SX300's AS SSD rating ended up being weaker than anticipated despite the SSD’s supposedly promising transfer rates. When tested under the CrystalDiskMark evaluation, the scores received by SX300 appear to be much more impressive, and do not seem to be too different from those of the other SSD models. The above IOPS figures are fairly typical of 256GB SSDs that feature SANDFORCE's impressive memory solutions. Apacer's SFD 25A-M 256GB features a 19nm NAND Flash chip from Toshiba and the SCJC72 controller chip. The SSD’s general read and write speeds during the entire performance tests were 511.64MB/s and 299MB/s, respectively. Under the AS SSD test, Apacer SFD 25A-M's read speeds were generally on par with the company's official specs, while its write-related performances were all above average. By the end of the evaluation, the overall AS SSD score earned by Apacer's SSD turned out to be highly impressive. Apacer’s SFD 25A-M performed similarly well under the CrystalDiskMark test, with read and write speeds that are superior to those of the other brands. The IOMETER figures, like the above test results, are highly noteworthy. Chuangjiu Technology's competitively priced 256GB CJ235 (JM667H) is one of the company's newest SATA3 SSDs that features the MLC-based NAND Flash component and Jmicron's JMF667H chip. 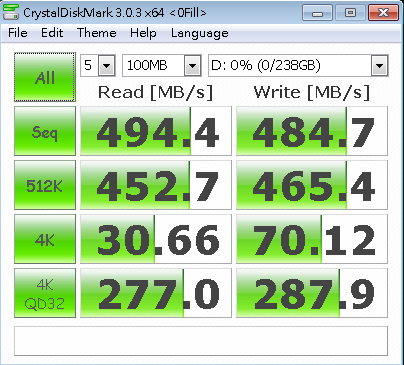 In the AS SSD diagram, both CJ235’s read and write speeds are revealed to be relatively stable, with only the former showing a noticeable fluctuation. The SSD's overall rating, at 1001, is slightly above average when compared to the other SSDs tested. Chuanjiu’s 256GB SSD performed well in the CDM test, particularly in the 4K and 4KQD32 categories. The IOMETER read speed is notably impressive, but the overall write score falls short of expectations. The F8 SSD model from KingFast, known to be one of the most affordable and common SSDs in the 256GB market, uses the JMF667H controller chip and NAND Flash chip from Intel and Micron. F8’s overall read and write speeds under the AS SSD test were decent and even approached 500MB/s at a certain point. However, when it comes to overall rating, the SSD's 762 benchmark score isn’t terribly impressive, especially when compared with that of most leading brands. F8's IOMeter scores are generally decent even though its write figure does not reflect the results from the previous tests. The SSD model that we received from Kingston comes from its HyperX 3K series, and features a total capacity of 240GB. Its main components include SandForce's SF2281 chip and Toshiba’s MLC-based NAND Flash chip. When tested with the AS SSD test, HyperX 3K’s writing speeds turned out to be mostly above average, but the results were not nearly as impressive as the SSD's read speeds. By the end of the evaluation, the SSD's total rating arrived at 729, which is about average when compared to the other SSDs. HyperX 3K’s CrystalDiskMark test yielded many promising results, particularly in the Sequential and 4KQD 32 categories. The IOPS read and write scores earned by Kingston's SSD are as strong as expected, and do not appear to be vastly different from the SSD's actual data transfer rates. 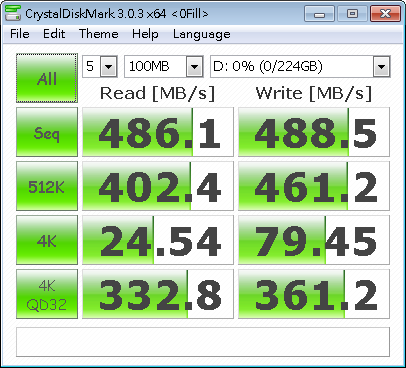 Kingston's other 240GB SSD, the KC300 SSDNow, uses the exact same SF2281 controller chip and MLC NAND Flash component as the HyperX 3K. The similarity and difference between the two Kingston SSDs will be discussed below. Under the AS SSD test, Kingston’s KC300 SSD model ended up with a total rating of 729, which is identical to what the HyperX 3K received. The curve movements shown in the AS SSD diagram appear to be largely similar to those of the HyperX 3K as well. In the CrystalDiskMark test, the highest write speeds shown by KC300 turned out to be just as impressive as the SSD’s actual write performances. KC300's IOMeter results in both the read and write categories are strong thanks to the SSD's impressive product design and controller chip. Crucial's M550 has become one of the market's hottest items in recent years. Even though the company isn't quite as popular as Intel or OCZ, its products' reputation is growing thanks to their affordable price. Crucial offers the M550 in a variety of capacities in order to satisfy the needs of different consumers. The SSD's main components include Marvell's 88SS9189 controller chip and Micron's 20nm MLC NAND Flash chip. In the AS SSD graph, the M550’s read and write speeds are shown to be relatively steady, with almost no major fluctuations from start to finish. Aside from a few minor differences, the numbers are generally consistent with the company's official specs. The SSD's 1084 score is currently the highest among the models tested. 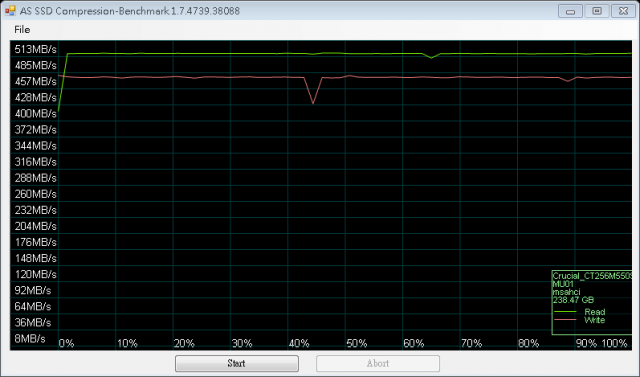 Crucial M4’s performances in the CrystalDiskMark test are highly noteworthy, particularly in the “Seq” category. All of the other results are in the standard range. The scores received in the IOMETER benchmark test, like the above figures, are highly impressive. The SSD model that Transcend delivered to us was its mid-ranged 256GB SSD370. The SSD features a standard MLC based NAND Flash chip and custom-made TS6500 controller chip. Transcend’s SSD370 was able to show promising results under the AS SSD test thanks to its reasonably impressive write performances. It is currently believed to be one of the most promising and reliable SSD products in its category. The read and write speeds shown under the CrystalDiskMark test, like the AS SSD results, are promising and generally fall in line with the company's official specs. The SSD370’s IOMETER scores turned out to be just as strong as we had expected. OCZ is one of the more popular global SSD brands out there with a decent sales and marketing reputation and products belonging to the high and low end categories. The Vector 150 is one of the company's most popular mid-ranged SSDs that uses the Barefoot 3 controller chip and Toshiba's 19nm MLC NAND Flash chip. The rating earned by Vector 150 under AS SSD reached a total of 1034, which is highly impressive. Both the SSD’s read and write curves are able to remain steady throughout the entire benchmark test. Thanks to its use of a new algorithm, the Vector 150 SSD showed respectable write speeds under the CDM evaluation. Vector 150’s IOMETER scores are mostly satisfactory due to the company's impressive controller chip. The second OCZ SSD that was sent to us for testing was the 240GB Vertex 460, which uses the Barefoot 3 M10 controller chip and Toshiba's 19nm MLC NAND Flash chip. Under the AS SSD benchmark, the Vertex 460's read and write speeds turned out to be slightly less impressive than the Vertex 15o's, but its overall AS SSD score still managed to reach 1009. Vertex 460’s CrystalDiskMark results are all above average level despite being lower than the scores posted by Vertex 150. In the IOMETER test, both Vertex 460’s read and write speeds ended up strong. 256GB SSDs are generally suitable for entry level users and computing devices like Notebooks and Desktops. The product is also good for system products, and can be equipped with additional hard disk drives.